Chemtube PPS chemical and fluid pump. WALLACE & Tiernan' s Chemtube PPS is a positive displacement pump system designed for handling a wide range of chemicals and fluids from liquid chlorine to heavy slurries to sludge. Efficient roller technology in the design of the Chemtube PPS eliminates the need for lubrication fluid typical of other peristaltic pumps using the sliding-shoe design. There are no valves, seats or seals required in the pumped fluid to foul or wear out. The result is high reliability and long-term operation with simple low maintenance. For maximum versatility in municipal and industrial applications, there are eight pump models available with hose sizes ranging from 10 to 76mm in diameter. Three choices of tube material are available offering a wide range of chemical compatibility. Flow rates from 9 to 65,888L/hr are available at pressures up to 16bar. A choice of constant speed, mechanical variable speed or variable frequency/variable speed drives are available for simple manual operation up to sophisticated automatic control schemes. Chemtube PPS pumps can be used with virtually any water treatment chemical and will self prime faultlessly even in high suction lift applications. They are also suited to use as sample pumps for on-line analytical equipment, or as chemical transfer pumps. 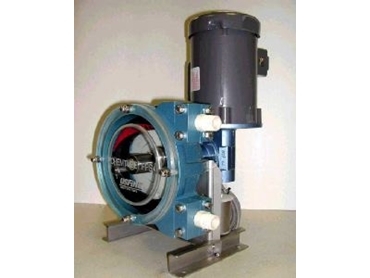 In wastewater treatment Chemtube pumps can handle a wide variety of sludges, including those with high solids content which may need to be dewatered. Chemicals which are highly viscous and shear sensitive, such as polyelectrolytes, can also be easily and reliably handled by the Chemtube system.